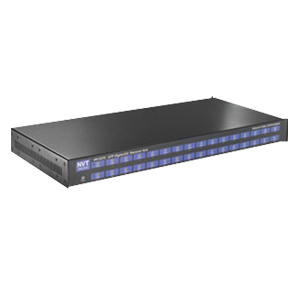 Employing NVT Phybridge’s DigitalEQ™ technology, the NV-3272 is an 32-channel active (amplified) hub that allows the transmission of full-motion monochrome or color video for distances up to 1 mile (1,6km) using Category 2 or better unshielded twisted-pair (UTP) wire. The receiver hub continuously and automatically conditions the video signal, compensating for cable attenuation, wiring polarity, ground loops, and voltage transients, independent of video signal content. The unparalleled interference rejection and low emissions allow long run video to co-exist in the same wire bundle as telephone, datacom, or low-voltage power circuits. This allows the use of shared or existing cable plant. Ground-lifting ensures no annoying “hum-bars” when ground-potential differences exist. With built-in transient protection, damaging voltage spikes are eliminated.